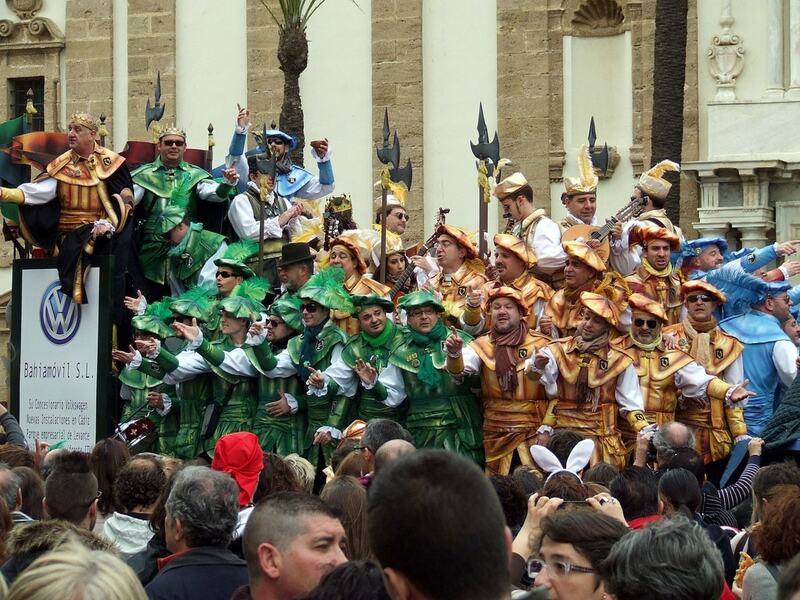 For two weeks every February-March, the enchanting Andalusian city of Cádiz celebrates its annual carnival. 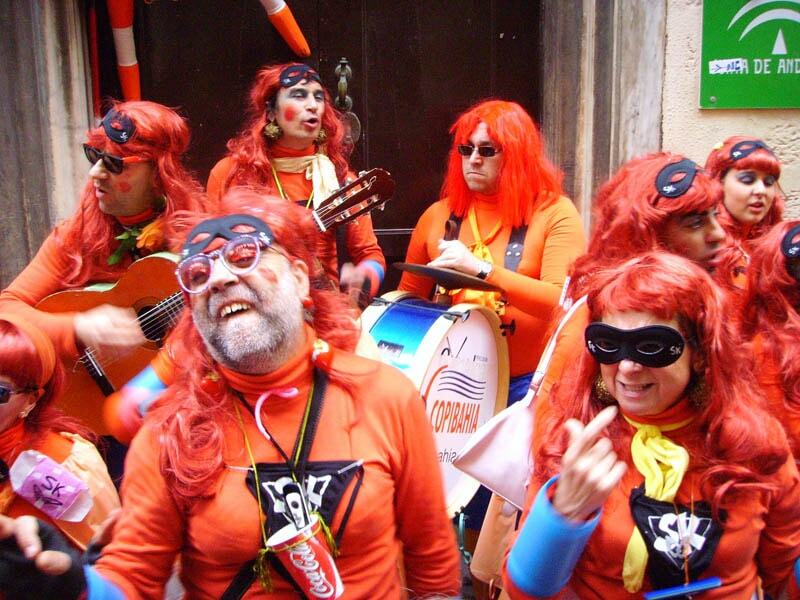 Famous for the roaming groups of colourfully attired street performers satirising current affairs, this is a celebration unlike any other in southern Spain. This joyfully anarchic celebration is believed to have been inspired by the carnival of Venice – a city with which Cádiz enjoyed prosperous trading relationships in the 16th century, when its port was one of the most important in Spain. Since then, the Cádiz carnival has become known all over the world for the roaming groups of street artists who sing witty, satirical songs about Spanish current affairs and prominent Spanish figures. It is hardly surprising that such groups have become the defining cultural emblem of Cádiz’s carnival: this is, after all, a city whose locals are known throughout Spain as always ready with a joke or an amusing one-liner. Kaleidoscopically attired in matching homemade costumes and with garishly painted faces, these meandering bands of wise-acres fall into one of several categories. 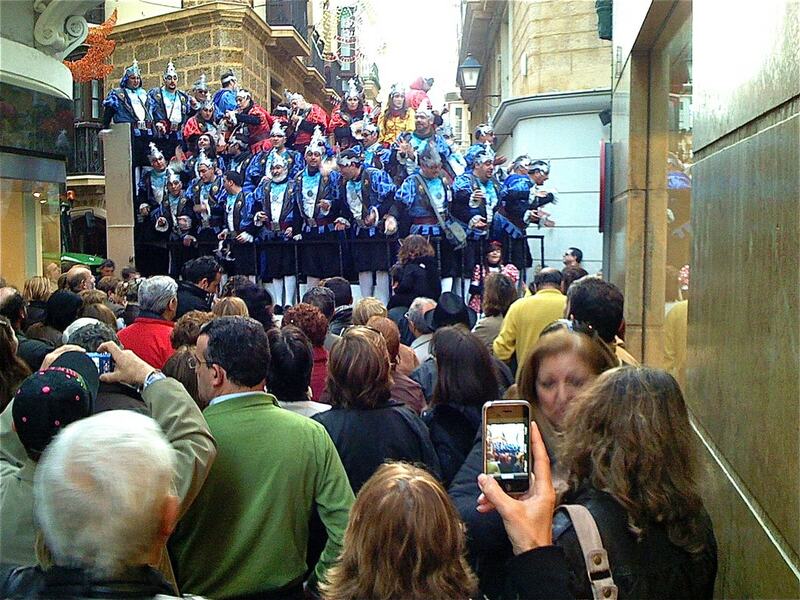 Most ubiquitous of all the singing satirists during Cádiz carnival are groups known as chirigotas. These may sing serious songs, but often the emphasis of their compositions is on humour. Something currently in the Spanish news – a corrupt politician, perhaps, or the misdemeanours of a celebrity – are cleverly mocked with inventive lyrics. Very similar to these groups are those known as comparsas, who also specialise in satirical songs but usually in a more serious manner, employing wit and irony to achieve their effects rather than gags or absurdity. Both employ song forms known as couplets – short pieces with a satirical chorus –and pasodobles, which are longer, more serious pieces without a chorus. By far, the largest groups that you’ll see on the streets of Cádiz during carnival are the choirs. These can feature anywhere up to about 20 performers and are carried through the city on open-backed carts. Accompanied by lutes and guitars, the choirs sing both serious and humorous pieces and specialise in songs that celebrate Cádiz and its people. Their signature tune is the ‘Carnival Tango’, and they wear the most elaborate costumes you’re likely to see during carnival. Then there are the so-called quartets, which, despite their name, are often made up of more or less than four performers. The quartets perform theatrical skits satirising some aspect of Spanish current affairs that has caught their eye. They beat time on the floor with a stick as they perform and sometimes use a kazoo, too. And finally, the solo performers at Cádiz carnival are called romanceros. These put on one-man shows with the aid of comical posters that help them convey their satirical messages. It’s virtually impossible to walk down a street or across a square in the old part of Cádiz during carnival without encountering a performing romancero. To see the best of all of these groups, head to the old fishing quarter of La Viña, or Calles Ancha and Columela in the historical centre. It is these performers who bring the streets of Cádiz alive with brilliant colours and comedy for two weeks every February, as well as competing in formal competitions in the city’s Falla Theatre. The end of carnival is marked by a quirky Spanish tradition known as ‘Burying the Sardine’, in which a papier-mâché effigy of said fish is burned after a mock funeral procession. After the sardine has been buried, all the comedians of Cádiz are free to start work on their dazzling compositions for the next year.